eD@HoMe: 2 great covers from Croatia! Many thanks to Tomislav Dolar for sending these 2 great covers from Croatia! 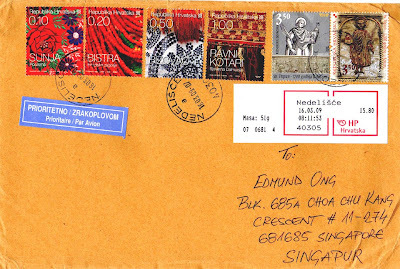 The first 4 stamps from the left on the first cover are part of the "Croatian Ethnographic Heritage - Folk costume" series, issued on 30th Sept 2008. 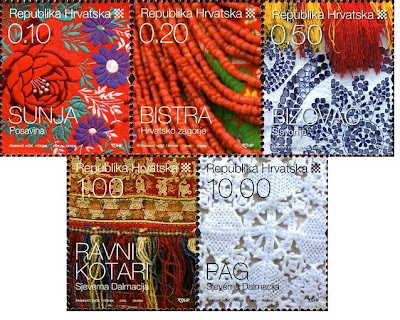 The stamps in this set depict Folk costumes from Sunja, Bistra, Bizovac, Ravni Kotari, and Pag Iace, Pag. 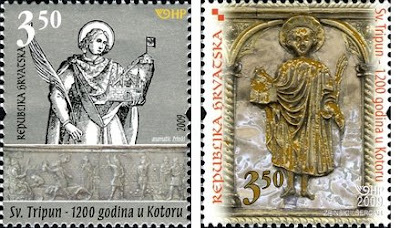 Next, on the cover is a set of 2 stamps from the "St Tripun for 1200 Years in Kotor" series, issued on 3rd Feb 2009. On the first postage stamp is an image of St.Tripun from the Statute and the Laws of the Town of Kotor in Venice. And the second stamp features a photograph of the image of St. Tripun depicted on the Central altarpiece, in the Cathedral in Kotor. Last but not least, is an ATM stamp with a denomination of 15.80HRK. On the second cover are 3 stamps and a red tab from the "Olympic Games Beijing 2008" series. 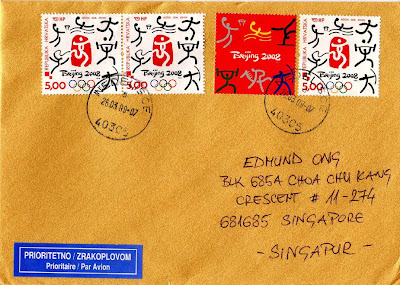 Like all other countries in the world, Croatia Postal administration issued a single stamp on 11th March 2008 to commemorate the Summer Olympics in Beijing. The 2 covers took an average of 8 days to travel an estimated distance of 9,704kms from Nedelišće to Singapore.